File under sad, but true: it's late January and I'm still winding up my Holiday Knitting. This was a special order item. Jason's mom has a bright red neck warmer/cowl that she absolutely loves. She asked me to replicate it in a more subdued color, and I jumped at the chance. Before I jump into my normal project description, however, let me say a few words about my knitting instincts. They are not what you would call "good". In fact, they are usually dead W-R-O-N-G. For a reason that I cannot explain, I was blessed with good instincts for the duration of this project. Such a rare series of good decisions is worthy of enummeration! I ripped it back and started again (#2). To avoid a roll at the bottom, I cast on with size 11s and did several rows of K1P1 ribbing (#3) before switching to the size 7s I used for the rest of the cowl. I ripped back an inch, and stayed with the no. 7s up to the last row. 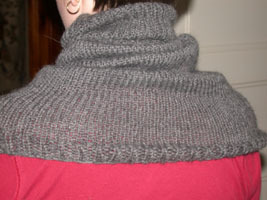 Then I did something radical: I switched up a needle size and did the tubular cast-off. Montse Stanley, who was gifted to me for Christmas, held my hand as I finished it off. If anybody's interested in the pattern for this, leave a comment and I'll type it up for you. It's a pretty fast knit and in the brief period that I had it on for picture taking purposes ("Quick, take the picture before the hives kick in! "), I found it to be very warm. Oh, and one more thing... any ideas about what I can do with several unused balls of this yarn? Row 7: Switch to smaller sized needles. K 56, pm, K to end. Continue knitting all stitches. When stockinette stitch section measures 1.5 inches, knit the following decrease row: K1, K2tog, K to 3 stitches before first marker, SSK, K1, slide marker, K1, K2tog, K to 3 stitches before second marker, SSK, K1. Next Row: K1 P1, repeat to end. Repeat this row until the ribbed section measures 6.75 inches (or desired length). 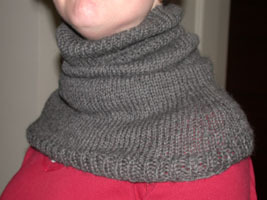 Bind off using tubular bind-off method, or your preferred elastic bind-off.